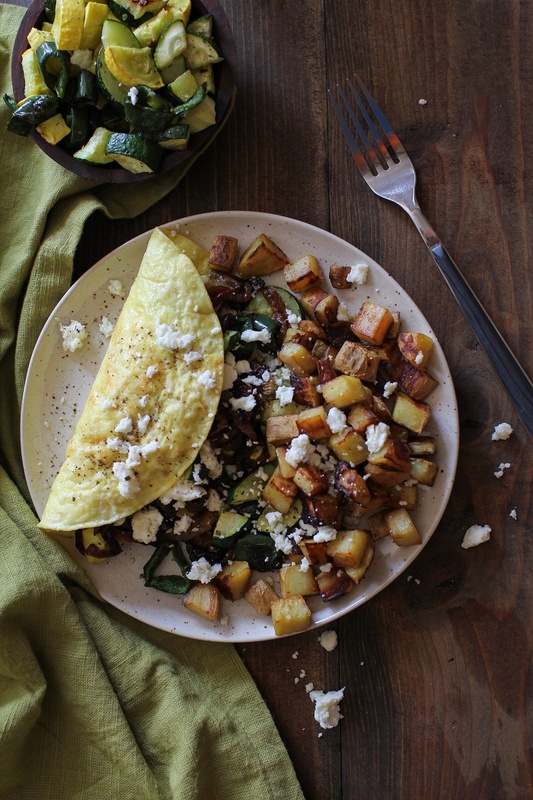 Hearty and nutritious breakfast omelette with roasted zucchini, yellow squash, and pasilla pepper, plus caramelized onion and feta cheese. A flavor-packed well-balanced meal. Breakfast is a big deal in my house. Like, mega status. Of monolith proportions. I wish you could witness the intensity that is the morning feeding session. 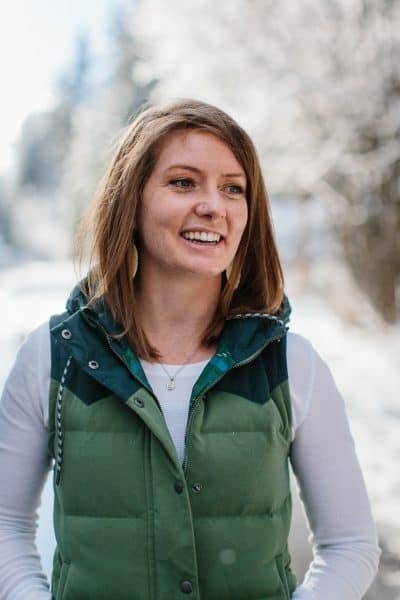 Growing up, I was a grab-a-bowl-of-cereal-and-go kinda gal, but once I got out of college, I started paying more attention to the food I ate, particularly in the morning. I’ve found I’m much more likely to have a whole day of clean eating if I begin with a filling, well-balanced nutritious breakfast than if I let my hair down and plow through something sugary and decadent. Plus, I tend to have more energy, a happier digestive system, and am even more chipper. A few weeks ago on a random Wednesday, the boyfriend and I went out to breakfast at a local cafe after a long trail run. 99% of the time, we make a veggie and egg breakfast at home – usually with potatoes, kale, onion, bacon and eggs – so when we eat the breakfast meal out, it feels like big treat to have someone else do the meal prep. On this particular occasion, I selected a veggie scramble with roasted summer veggies, caramelized onions, and feta. The meal came with seasoned crispy home fries and gluten-free bread. I was so psyched by the meal, I was determined to put it on repeat. So that’s precisely what I did, in the form of an omelette. I’ve told you in past recipe posts, I consider caramelized onions to be nature’s candy, and when added to an omelette? Sheer magic happens. The roasted zucchini and yellow squash in combination with the nature’s candy + feta makes for a super well-balanced mouth-watering way to start the day. 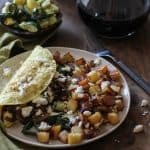 I whipped up my favorite Sweet Potato Home Fries using jewel yams to go alongside the omelette, and thought in retrospect the Beet Hash Browns I showed you a while back would be the perfect sidekick, too. In addition to the already well-rounded meal, I decided to throw in collagen peptides to add to the nutrient spectrum. 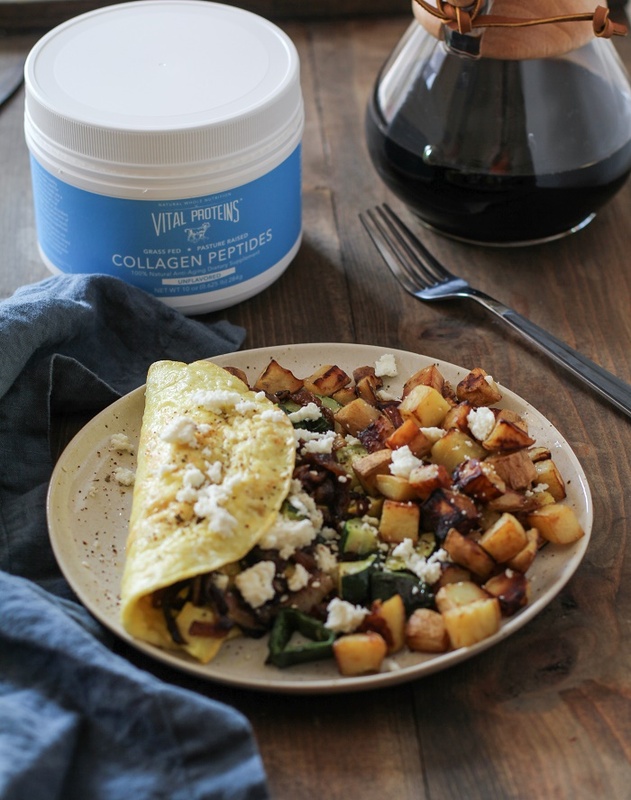 Collagen is the most prevalent protein in the body, and is the key building block to all connective tissue. It provides the infrastructure to the musculoskeletal system, providing the foundation for physical mobility. Consistently supplying your body with collagen promotes the cohesion, elasticity, and regeneration of skin, hair, tendons, cartilage, bones, and joints. Promotes youthful, healthy skin, shiny beautiful hair, and strong nails. Helps keep bones healthy and strong, and supports joint health. The natural glycine in collagen promotes healthy immune, digestive, and central nervous systems. Collagen peptides are naturally flavorless and dissolve in both hot and cold liquid, making them super easy to add to any meal. I whisked in a scoop of Vital Proteins Collagen Peptides with the eggs for this omelette, thereby broadening the health benefits of this nutritious breakfast. For those of you who typically wake up super hangry, I’d recommend caramelizing the onion and roasting the vegetables ahead of time. That way, when you go to make the omelette, all you have to do is cook the eggs and heat up the veggies. You can use any type of vegetables for the roasted veggie portion of this meal. Consider bell pepper, cauliflower, broccoli, asparagus, sweet potato, etc. During the fall/winter months, you can use any winter squash such as butternut squash or acorn squash. Use any of your favorite cheeses. I’d suggest havarti, gouda, or gruyere. 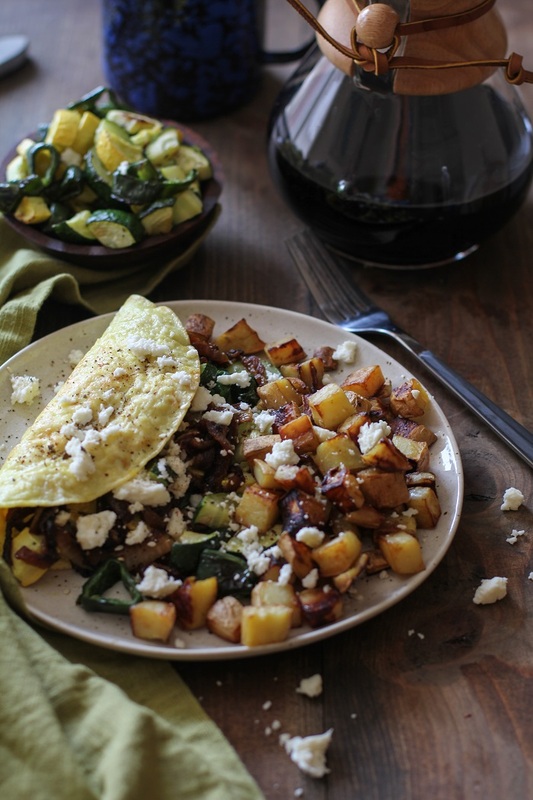 This recipe makes enough roasted vegetables for 3 omelettes. If you end up with leftover roasted veggies, you can add them to salads, burritos, or scrambled eggs. If making omelettes for more than one person, you can whisk 2 to 3 eggs at a time per person, or make a large batch of beaten eggs and add them to a skillet a little at a time. Add a sauce such as pesto, chimichurri, roasted red pepper sauce, etc. Add enough olive oil to a medium-sized non-stick skillet to generously coat the surface, along with the sliced onions and about 1/4 teaspoon of sea salt. Heat over medium-high and saute, stirring occasionally, until onions begin to sweat and begin turning translucent, about 5 minutes. Reduce the heat to medium and continue sauteeing, stirring occasionally, until onions begin to brown, about 15 minutes. Reduce heat to medium-low and continue cooking, stirring occasionally, until onions are deeply browned and caramelized, about 25 to 30 minutes more. Note: If onion begins to stick to the pan at any point, you can de-glaze with a few tablespoons of water. While the onions are caramelizing, you can roast the vegetables. Preheat the oven to 375 degrees F. Toss the chopped zucchini, yellow squash, and pasilla pepper in 2 to 3 tablespoons of olive oil, using your hands to ensure all of the squash is coated. Sprinkle generously with sea salt and Italian seasoning. Spread the vegetables on a large baking sheet and roast for 15 minutes, turning halfway through, or until squash is golden-brown and al dente. 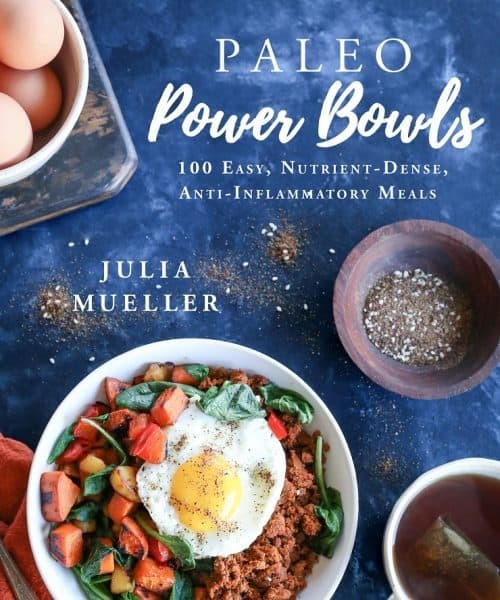 Whisk the eggs and collagen peptides together in a bowl along with some sea salt, until well-beaten (note: if preparing an omelette for more than one person, beat desired amount of eggs. You can also blend the eggs and collagen in a blender). Heat about a tablespoon of olive oil in a medium-sized skillet over medium heat (note: an 8 to 10-inch skillet works great for a 3-egg omelette). Pour in the egg/collagen mixture and cook until edges and center have set up, about 3 to 5 minutes. Carefully flip and cook another 15 to 30 seconds just to finish cooking the eggs. 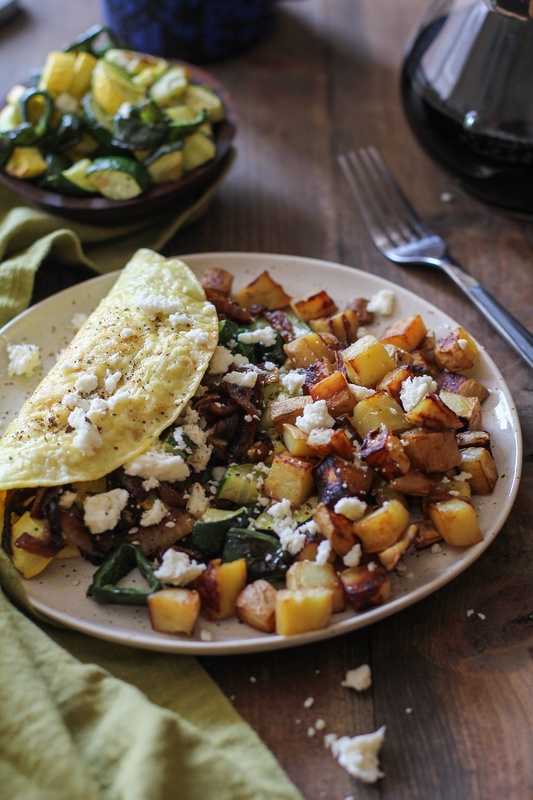 Transfer the omelette to a plate and stuff with desired amount of roasted vegetables, caramelized onions, and feta cheese. Serve with sweet potato home fries and enjoy. This post is sponsored by Vital Proteins. All thoughts and opinions are my own, and I thank you for supporting the brands that help make this site possible. This looks so good! I love roasted veggies and putting them in an omelet? I love doing that too! This looks like the perfect breakfast! I love all the added veggies- yum! I feel the same way about breakfast! That’s actually been the one area I’ve been struggling with in Seoul. Everything is crazy expensive and trying to find eggs (without meat) for less than $30 has been a bit of a challenge. I’d give anything to wake up to this caramelized onion omelette. It looks heavenly! !